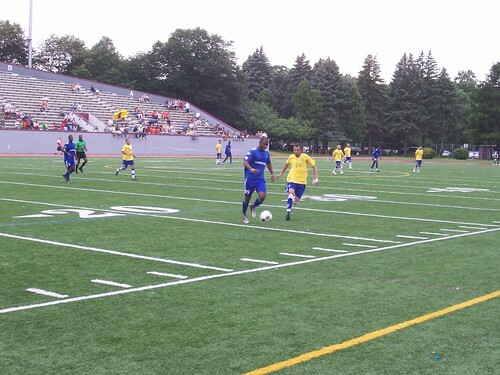 The ONE Lowell World Cup ended as most international soccer tournaments do, with a team from Brazil winning. Still, the runners-up from Nigeria/Liberia put out a great effort in a cracking match that finished 3-2 to the side in yellow. Sentimental favorites Somalia succumbed to Brazil in the semi-finals but did manage to finish third. After losing last year's final on penalties and failing to win the tournament in the first two years of the competition, local favorites Brazil finally took home the ONE Lowell World Cup. But the African nations in the tournament had a great showing, with Nigeria/Liberia reaching the final and Somalia and Ghana each reaching the semi-finals. The African teams also had an impressive turnout of vocal fans who lent a lot of atmosphere to the matches. And, as usual, there was a strong contingent of Brazilian fans in attendance to cheer on their side. If you missed this fantastic event this year, don't miss it next year. It features high-quality soccer (seriously, the Sunday matches were fantastic), great fellowship and a lot of fun.